Professional web developer since 2006. 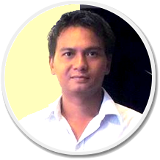 Co-founded a software development and consultant company called Fairway Technology and currently working as Managing Partner. Author of the book Ubuntu: Linux for You. A how-to guide on Ubuntu Linux for super-user and developer, which covered topics from installtion, system configuration, desktop customization to Linux directory structure, file permissions and command line interface. Author of the book Rockstar Developer. A book about software project management, process management and back-end architecture. Including modern development stack with NodeJS, MongoDB and ExpressJS. With my dear wife and a lovely daughter.